Update: Cross Channel Mojo Bonus added. Details in this post. In today’s fast-paced, new media-driven world, it can seem almost impossible to attract and keep the attention of your prospects and customers with all the potential distractions. What you need is to leverage the “Bernie the Barber” effect (more on that in a bit). You know that using traditional marketing approaches are simply no longer working. Now, even using just one “new-media” marketing channel is not enough. 78% of consumers use two or more channels when making a buying decision, according to Oracle’s 2011 survey. If you’re limiting your business to just one, you’re losing sales. …so what can you do about this and where can you learn how to start gaining influence and profit from using cross channel marketing? Earlier this year, I created the Map to Online Marketing Success that showed the formula for reaching success using cross channel marketing. I’d planned on turning it into a training course, but the best in the business, Mike Koenigs, beat me to it. He’s actually offering a FREE video series. I’ve seen a lot of his videos over the years. This one is outstanding and shares a message that people need to see. Click on the video below to see his video series. 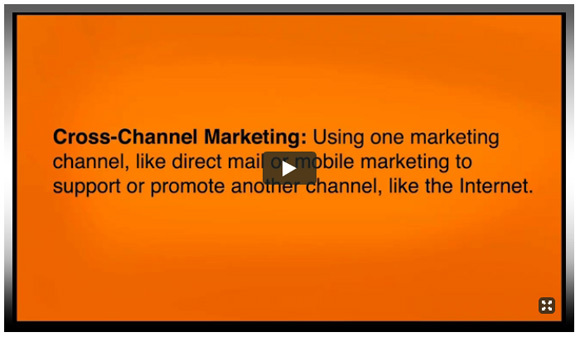 Cross Channel Marketing is using one marketing channel, like direct mail or mobile marketing to support or promote another channel, like the Internet. Using Cross Channel Marketing properly, you can gain more customers than the big companies. You just need a system that leverages the “Bernie the Barber” effect. Bernie, Mike’s father, is a barber. He loves building quality relationships with people. This is how he reaches more people and allows his business to thrive. It’s all about the quality relationships. You can use multiple channels to deliver your message, add value to the lives of your prospects and customers to reach more people (and thus develop your Cross Channel Mojo). Mike is on a mission to create 1 million millionaires in the next 5 years, so he’s sharing what it takes to do it. It’s what worked for him, many of his clients and students and their clients, and it can work for you too. Right now, there is a huge gap that needs to be filled between marketing and technology. Schools are simply not teaching how marketing and technology are – or at least should be – so inter-related. Mary Meeker, Paul Dunay and many others are sharing the importance of bridging this gap, and it’s been referred to as The Rise of the Marketing Technologist. Marketing Technology is exploding and when bridging the gap properly, it can be hugely profitable for those that use the tools. It’s the same strategies. It’s just that you need to change how you communicate. It’s bigger and more powerful than the Internet or social media alone. Let’s say someone who wants to buy your stuff is called customer X. The golden days of just sending Customer X an email and having them buy are pretty much over. Now, your Customer X is literally like a moving target. They are mobile, updating their Facebook status, Digging this, Liking that, tweeting and texting all while on the go … they are just not sitting around waiting for your email to come in. They are also more likely to trust peer reviews and what others say about you. Oracle’s Study, Cross-Channel Commerce: A Consumer Research Study March 2011, revealed social media and mobile commerce are increasingly important in shaping customer behavior. Most significant, 78 percent of U.S. consumers regularly use two or more shopping channels – and 30 percent use three or more channels to complete transactions. “In an extremely competitive environment with consumers leveraging multiple channels to make decisions and complete transactions, and often using more than one at the same time, a cohesive customer experience becomes a key differentiator,” explains Andrea Morgan-Vandome, vice president of strategy, Oracle Retail. So the bottom line is, it’s a big problem if you are limiting yourself to a single marketing channel. 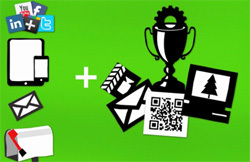 Plus, there’s really then a HUGE opportunity when those are enhanced with videos, QR codes, evergreen webinars, contests and prizes. …and wouldn’t it be nice if there were a system to integrate all of these? This is what Cross Channel Mojo is all about. Mojo is defined as “a spell or magic” and Cross-Channel is a recent marketing buzzword. The recent research and studies have provided the proof – when you communicate effectively across multiple channels, you get more prospects and customers. The likelihood of converting a customer is THREE TIMES higher when using multiple channels. So, let’s do an exercise. How many new customers to you gain each year? Is it 100? If so, how much are those 100 customers worth to you? Seriously, think about how many new customers you obtain and how much they are worth to you. Write down a number. According to the research and studies, if you’ve been using only one channel, you should be able to double or triple what you are bringing in. What would that be worth to you? Write it down. That’s impressive, right? …and this is working. Successful marketers are using this. When the top online marketers were surveyed, 96% said they plan to use cross channel marketing in their marketing efforts in the coming year. Big businesses are having great success with cross channel marketing as well. Isotoner, Outback and FedEx all have recently focused on Cross Channel Marketing and reaped the rewards. For most small business, authors, speakers and experts who aim to reach and retain more customers, it all comes back to the “Bernie the Barber” effect … Gaining customers from building quality relationships with people. Genuinely adding value to lives of your prospects and customers is what it’s all about. By connecting more personally and through multiple channels, you connect with them on a deeper level than the internet or email marketing alone allows you to do. People using this are successful and still earning money. Many others ask, where’s all the money gone? Why are people camped out on Wall Street? Why are real estate values still so low? Why are there so many bail outs? The answer is that the money has NOT disappeared, but the money IS in the relationships. There’s been recent talk of the 1% and the 99%, but it’s the 1% that holds the quality relationships and quality reputation and the 99% that do not. …and when you and/or your company secure and maintain quality relationships and reputation, that’s when you don’t have to worry about money ever again. Be sure to keep your eye out for the summary of the next video in this series. Also, please leave a comment or ask any questions below and/or use the share icons below to share this with others who could benefit from learning more about cross channel marketing. So, true. It’s all about relationships and I can see how it would be valuable to integrate the channels to strengthen relationships, but what’s the system? It seems it started to say, but then didn’t. Yes, Amber. Exactly, and you are correct. The post was a summary of the video and it just hinted at the system. The details on it will be provided in future videos, but it’s called Instant Customer (originally called Monster Follow-up). We’ve been using it for ourselves and clients and it’s a great tool because you can capture a lead from anywhere and then follow-up automatically via multiple channels (email, text, voice, etc.) and has a ton of special features.